By: Erik Hyrkas on September 22, 2017. A new bike-sharing service has been spotted in the wild of Washington, D.C. this month. 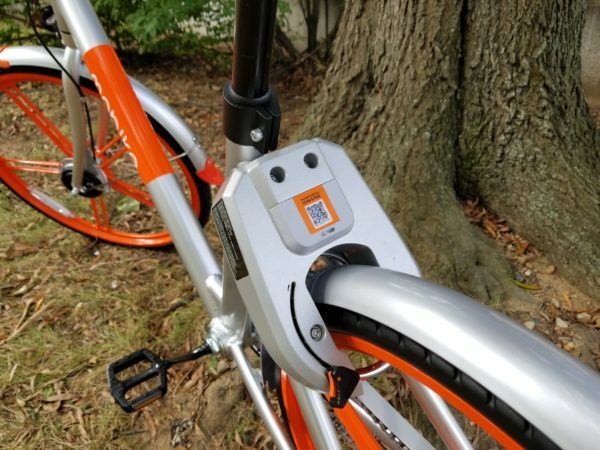 Mobike, a popular service in the UK and China, has just launched its QR-Code bikes in Washington, and it’s the first U.S. city to receive them (There are five million Mobikes in Europe and Asia). Tech Void spotted the Mobike in these photos close to L’Enfant Plaza parked by a tree the past several days. The service comes with a nice twist compared to DC’s more traditional Capital Bikeshare or NYC’s Citi Bike. 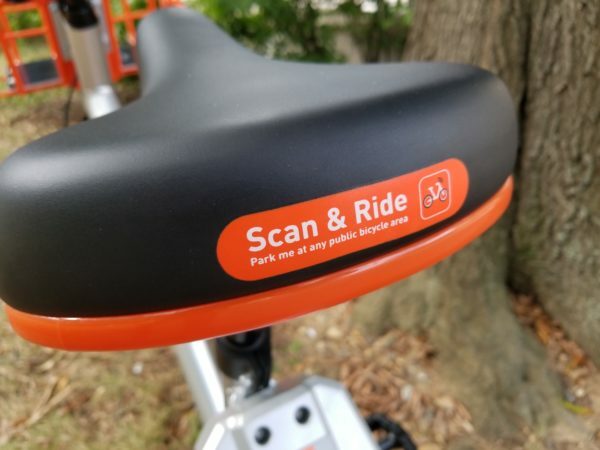 Instead of having physical docking stations for bikes all over town, customers can pick them up by unlocking Mobikes with their smartphone using the QR codes marked on the back. The bicycles are stationed all over the city in “public bicycle areas” without any kiosks, locks, or docking stations at all. 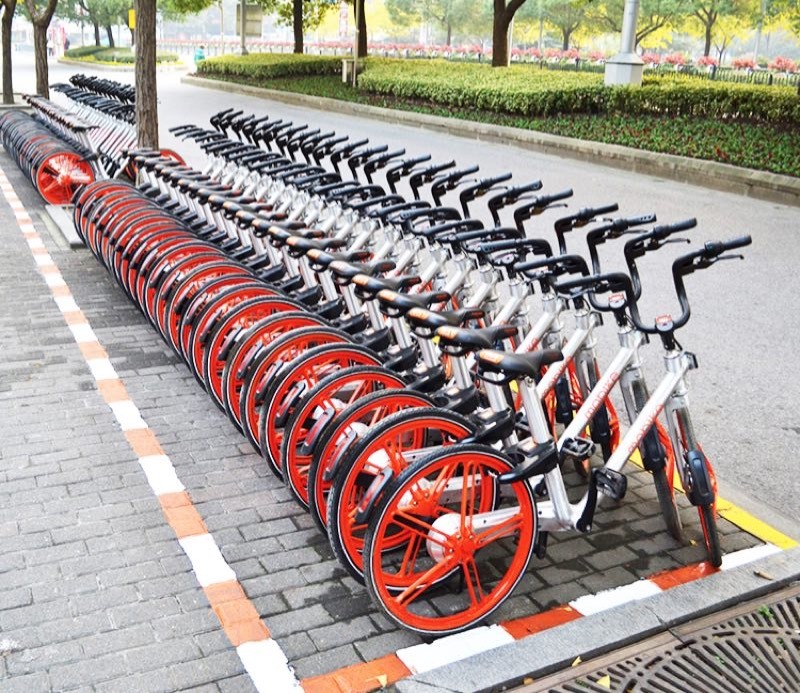 When riders arrive at their destinations, another designated parking area noted by Mobike, customers can lock the rear wheel manually using a lever on the back to end their trip. These bikes also come with baskets, a relatively attractive orange and silver design, and they appear much lighter and less clunky than a traditional Capital Bikeshare bike. And really, what beats a basket? Mobike claims they’re pretty durable and functional. They have non-puncture airless tires, a light frame, durable disk brakes, and three gears. And like the Capital Bikeshare bikes, the headlights are powered by pedaling. As for cost, a Mobike ride costs just $1 for half an hour, but they do say that a refundable deposit is required to use Mobike. There also are plenty of coupon code offers circling for ride credit. According to the app, each new user receives 100 credits upon signing up. Mobike is offering the service free to new users until October 1, however funding your account appears to still be required (via credit card). In Mobike’s marketing video above, they advertise this more for casual trips to the grocery store and cafe than tourists checking out the sites. So while it may be competitive against Capital Bikeshare for locals running errands, it’s likely Mobike won’t be making a dent in the tourists on red bikes flying around the National Mall. Mobike is still asking users to suggest places for Mobike bike parking areas to be located on their website. In other cities, docking stations are marked by white and orange zones painted on the ground, so time will tell how Mobike sets up their parking stations in D.C. with Capital Bikeshare already taking up plenty of sidewalk. Are you planning to try Mobike in the District? Let us know what you think of the new bike-sharing option in the comments. Photo of Mobikes parked in a designated area outside of the U.S.
Last updated by Erik Hyrkas at September 22, 2017 .